DCI World Championship in Indianapolis. 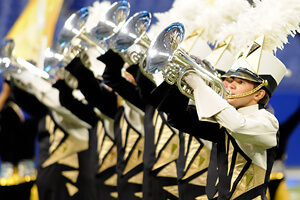 The Glassmen Drum and Bugle Corps, founded in 1961, announced today that they will not participate as part of the competitive 2013 Drum Corps International Summer Tour. For many years the corps' bingo operation has provided its primary source of revenue. The sharp decline and ultimate discontinuation of bingo combined with difficult economic conditions have made fielding a corps difficult. "We have done just about everything we can to both cut costs and find other revenue streams over the past two years and have been able to keep providing a great experience for our members, volunteers, and fans. Our sponsors, volunteers, staff, and families have been unbelievably supportive," President of the Glassmen Board of Directors Tom Sink said. "Part of our mission is to teach young people life skills and character. It would be contrary to that mission and irresponsible to continue to amass additional debt. Taking time off from competition and touring will allow us to get our finances in order, create new relationships with sponsors while strengthening current ones, and create a viable and sustainable plan that will carry us into the future. We are not finished, we are just pausing to catch our breath. We are absolutely committed to doing whatever it takes to come out of this stronger than ever. The legacy of dedication, hard work, and family that has been created by 51 years of excellence demands it. We owe our alumni, volunteers, staff, fans, and devoted veteran members no less than to protect the integrity of the Glassmen name and reputation. They are the ones who built it." Sink and the Glassmen Board of Directors also affirmed the organization's plan to continue to raise funds to retire the current debt, and to intensify the search for a permanent executive director. "We need to take care of old business before we continue with any new business. This will not happen overnight, but we know it can be done." Sink continued, "This was an excruciatingly difficult thing to do because we know how many lives this touches. In the end, knowing we had done all that was possible, we had to take emotion out of it and do the responsible thing. We are confident that this decision is what is right for not only the Glassmen family, but for the drum corps activity as a whole. We look forward to fielding a corps in the near future, once again offering 'An Experience of a Lifetime.'" Further details and ongoing status updates will be available through the corps' website, Glassmen.org.